What does the word "germinate" mean? To germinate means to start to grow. Nutrients are substances that living things need to grow. Nutrients include food, air, water, and vitamins and minerals. Teachers—download lesson plans to use in your classroom! Plants come from seeds. 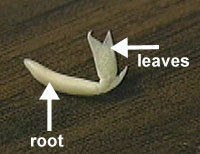 Each seed contains a tiny plant waiting for the right conditions to germinate, or start to grow. What Do Seeds Need to Start to Grow? The germination stage ends when a shoot emerges from the soil. But the plant is not done growing. It's just started. Plants need water, warmth, nutrients from the soil, and light to continue to grow.